South Shields avenged their early-season defeat to Colwyn Bay with a comfortable 4-1 victory over the Welsh side at Mariners Park on Saturday. The Mariners were in control from the start against the Bay, and took the lead in the fourth minute when Gavin Cogdon finished off a flowing move. The visitors were reduced to 10 men midway through the first half when goalkeeper Matt Cooper was given his marching orders for a foul on Cogdon, and from the resulting free-kick, Julio Arca curled a sumptuous effort past substitute Kris Leigh. Darren Lough fired in his first goal for the club eight minutes before the break and, although Danny Andrews pulled one back for the Bay, Shields were never seriously troubled. They completed the scoring in the 56th minute as Robert Briggs rattled home a penalty to leave the Mariners just once point short of securing promotion. It’s a slightly complicated process, but a point would mean that, even if Shields were overhauled by Scarborough Athletic and Hyde United and finished third, they would be guaranteed to possess the best points per game ratio of any third-placed finisher at their level in the country. The third-placed team with the best points per game ratio at this level will earn automatic promotion. Up against a Colwyn Bay side which caused them many problems in an early-season 4-2 defeat, a difficult afternoon was expected at Mariners Park for Shields on Saturday. But the Mariners got out of the blocks swiftly and took the lead in just the fourth minute. Arca sprayed a glorious pass from the centre of the park to Lee Mason on the right, he beat his man and squared for Cogdon to bundle the ball home. The Mariners continued to cause their opponents problems before a key moment came midway through the first half. With Cogdon running through on goal, goalkeeper Cooper came charging out of his area and brought the striker down. Perhaps harshly, he was shown a straight red card, and his replacement Leigh’s first action was to pick the ball out of his net after Arca curled a sumptuous free-kick into the corner of his goal. Shields were rampant and almost had a third when Jon Shaw clipped a pass forward for Cogdon, who turned his defender and rattled an effort against the foot of the post. Carl Finnigan was denied by a close-range save soon after and Jamie Holmes went close before the points were eventually wrapped up. Lough drove inside from the left and played it to Cogdon, who flicked it back into the left-back’s path. First time, he sent a bullet of a shot into the top corner as Lough registered his first goal for the Mariners – 15 months after joining. The Welsh side regrouped, and pulled a goal back a minute before the break when an Andrews effort from distance took an awkward bounce and found the top corner. There were chances at both ends at the start of the second half, with Shields goalkeeper Liam Connell doing well to keep out a free-kick from Josh Brizell before Finnigan was denied at the other end. The Mariners’ fourth goal arrived when Finnigan was fouled in the area and Briggs made no mistake from the spot. Shields mostly conserved energy in the closing stages, though Luke Sullivan, Shaw and Holmes all went close, while at the other end Connell saved well from Andrews. The Mariners had moved three points closer to promotion. One more will do. 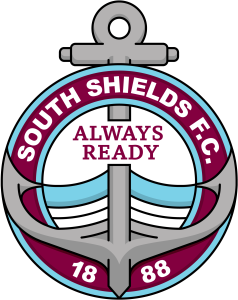 SOUTH SHIELDS: Connell, Baxter, Lough, Shaw, Morse, Arca (c) (Ross 68), Mason, Briggs (Richardson 57), Cogdon, Finnigan (Sullivan 57), Holmes. Subs not used: Woolston, Biwer. Goals: Cogdon (4), Arca (24), Lough (37), Briggs (pen 56).